Curriculum Vitae that is commonly referred as CV (its shorthand abbreviation) is a Latin word meaning course of life. CVs are for the PhDs. In other words a CV is a popular document among academics. In a job search regime, a CV is used as a detailed document of your accomplishments both academic and professional. Resume on the other hand is a short and brief document that lists your professional achievements. Well in short the only difference between a resume and a CV is the length. Expanding, a CV is static and is not a document that needs to be modified for every job search. A resume needs to be tailored. The document changes only when your accomplishments grow. A CV should include your dissertations, publications and anything that adds to your life’s achievements. A resume should be modified with every job search. You should be using your tailored resume for different positions and different companies. Today you should be using a professionally written resume for every job you apply. 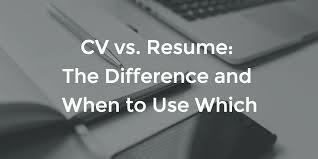 Next the question that haunts most job seekers is when to use a CV over a resume. You will find the answer to this question in the job listing where the employer would mention whether it is looking for your CV or resume. At times the employer wants to review your CV to consider your resume. Now when you know the clear difference between the two, you should be able to use the right document at the right place.